Capsule Hotel Bali - New Seminyak kohteessa Seminyak, Indonesia: Varaa nyt! Great atmosphere and the capsules give you amazingly comfy space to sleep and hang out. 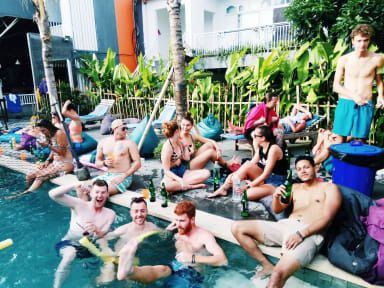 Staff is so friendly and the hostel is excellent for solo travellers to meet some cool people! Hostel was really nice and the environment was really good. Wouldnt recommend to book more than 3 nights (you probably want to chill out at some point). Also, we had some sort of bucks which bite me at nights so bad that I needed to leave before my booked nights came to an end. Still - if you are up to partying - you really should stay here!! Awesome hostel! Meant to stay here for only 2 nights but ended up spending 5. Very good place to meet people and the staff was very friendly as well. A party hostel so if you are looking for a quiet stay this might not be the place for you. Beds were big and very comfy! I love how they play chill out music in the morning in the bar, makes me happy right when I wake up!